You, Me and Movies: Review: "The Meyerowitz Stories (New and Selected)" is a surprise all around. Review: "The Meyerowitz Stories (New and Selected)" is a surprise all around. Well that wasn’t what I expected it to be. You know, I absolutely love it when a movie comes completely out of nowhere and blindsides me. For the better, that is. I don’t like bad surprises, I love good surprises. That’s precisely what “The Meyerowitz Stories (New and Selected)” is, a good surprise. You would think that a movie starring Dustin Hoffman, Ben Stiller and Adam Sandler would be a specific type of comedy. You would think that Adam Sandler would rely on his ludicrous hyper-active comedic strength to carry the movie. After all, that’s what he’s been doing for a long time now. You would think that since Sandler is in the lead, both Hoffman and Stiller would also lean in on the crazy comedic, the safe slapstick. That’s not the movie Noah Baumbach has made though. One could definitely take a look at “The Meyerowitz Stories (New and Selected)” and think it’s a healthy mixture of Wes Anderson and Woody Allen. I got the vibe of both directors while watching this. There is also an authentic mockumentary feel, almost. The kind of vibe you got from Baumbach’s earlier film “Frances Ha,” a movie I also absolutely loved. But this film isn’t just the sum of other film’s parts. There is always a fine line between homage and pure adaptation. Baumbach has told a relatable story, with some slight familiar ground. There are three Meyerowitz kids, between the three of them they were born by two different mothers. There is Danny (Sandler), Matthew (Stiller) and Jean (Elizabeth Marvel). The kids have all kind of lived in the shadow of their father, the great Harold Meyerowitz (Hoffman) who is a world- renouned artist. It was expected that his kids would be artists too, but the three children, more or less, went in different directions. They never quite felt the love of their father, especially when it came to their life choices. The siblings are a little estranged to each other. Jean and Danny had the same mom, but Matthew had a different mom and that has always made their relationship a bit odd to say the least. So when Harold has to go to the hospital right before his own retrospect, the weird relationship flows through. It's quickly established that this is a semi-broken home, and as the movie moves forward, the siblings begin to care for each other more. Some compromises and promises are rewarded, some discussions are had and some points made. This is a movie where you are going to laugh even when you feel like you shouldn’t be. But the cast is so good here that you kind of forget how wrong-headed the whole clan is here. Adam Sandler has made a career on the same type of comedy, almost seemingly purposefully type casting himself as the same kind of character. There are rare instances when he breaks from the mold he created for himself. The Adam Sandler in Paul Thomas Anderson’s “Punch-Drunk Love” is not the same Adam Sandler we see in “The Waterboy” or “Happy Gilmore” or “Billy Madison.” Nor is the Adam Sandler we see in “Reign Over Me” anything like those other guys. I think, deep down, there is a Oscar-caliber performer buried inside Sandler, he just likes being an usual goof that we rarely see it. You can read reviews for this movie and they agree, this is a once-in-a-million-lifetimes performance by Sandler, and I am a guy who usually loves his lout routine. If you can’t stand crazy Sandler, this film is for you. He’s funny without shattering the screen around him. He creates a genuine character out of performance instead of anger. It’s rare in the greater filmography of his career and he is downright commanding on screen here. It sounds like it would be easy to overlook the other actors in this ensemble, but it is not. 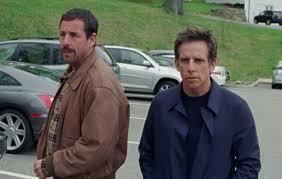 Stiller, who feels like he’s been on hiatus for God knows why, delivers an impeccable performance. There is a moment deep in the film that feels so revelatory, so good that it could only come from Stiller. You’ll know the moment when you see it. This is a different kind of comedy. For a couple years now, I have been pretty harsh towards Netflix’s lot of movies. Only because their TV originals have been so strong, you’d think they would make equally strong decisions when it came to movies. I always thought many of their movies were boring, some were even good. But they never had any great movies. I think that will be changing tremendously this year forward. Netflix has had a strong year of great films this year, and I hope that streak only continues in the future.